Beginning this month — October 2015 — ADW will partner with three Taos nonprofits to bring new programs in student training and Warrior Canine Connection™ forward. We are very grateful to Taos Community Foundation, Clothes Helping Kids, Inc., AmeriCorps, and the Juan I. Gonzales Taos County Agricultural Center for their generous support that is helping to make these programs in Taos possible. Denise Dumesnil is a clinical social worker whose first contact with ADW was in obtaining Clark, a facility service dog. Denise has been integral as we make this Taos expansion. Rocky Mountain Youth Corps will integrate ADW’s Student Training class into its Learning Lab, an AmeriCorps community service program designed for middle school students who are disconnected from school. This program and Not Forgotten Outreach received an AmeriCorps planning grant to pilot ADW’s offerings in Taos. Not Forgotten Outreach is a Taos organization led by veterans. It dedicates its mission to motivating military veterans and Gold Star families of fallen warriors to participate in recreational and therapeutic activities that facilitate healing. Not Forgotten Outreach is our partner organization that will host Warrior Canine Connection™ to veterans in Taos. Finally, Community Against Violence — the region’s only domestic and sexual violence shelter — will offer a Student Training program to the children it serves, a program being uniquely tailored to these childrens’ needs. A lot of what I do as a clinical social worker is to create connection with and empowerment for people who have experienced trauma. 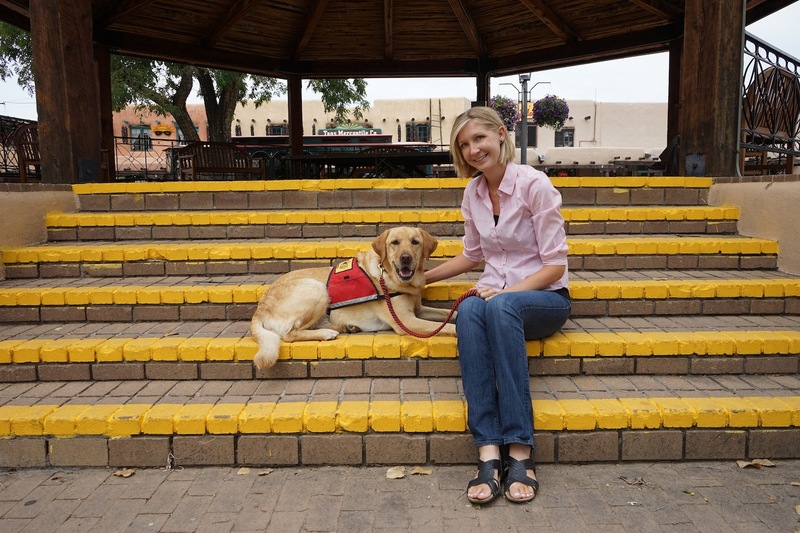 I have always loved ADW, but during the process of getting a facility service dog named Clark, and especially during my participation in Client Placement Training, I found myself astounded by the similarities of what ADW does and my social work practice. ADW just helps get my work done better and quicker because of the wonderful service dogs — and no stigma associated with being around them! Taos and Taos County, where I work, are rural and largely impoverished regions offering relatively few social services to those who have been affected by trauma. In light of this, we are delighted to share the hugely exciting news of ADW’s program expansion to Taos. All of this stems from my work with Clark. Clark has worked with me at our local hospital. He has been a participant in my legal advocacy work, attending sessions with adult survivors of sexual violence who had to re-tell traumatic stories of sexual violence and its aftermath. Since 2014, Clark has been integrated into my play therapy sessions with children victims of violence at Community Against Violence, the Taos domestic and sexual violence shelter and service organization. ADW’s approach to training the dogs and working with clients is based exclusively in building on positive interactions and never exercising power or force over the dog. This is so powerful. The hands-on skills that Taos student trainers and war veterans will learn as we teach them to train service dogs is going to be very significant in Taos!